Let the Star lead the way this Christmas so that you may be LED to the baby Jesus in our biblical Garnet Wiseman costume. After Jesus was born in Bethlehem in Judea, the three Kings known as wise men from the East came to Jerusalem to gift him with gold, incense and Myrrh. Our biblical red Garnet Wiseman costume includes a purple pointed hat with leopard print band and protective neck flap, long-sleeved red and purple shirt with gold trim, patterned light brown fleece vest with leopard print faux fur trim, Matching red belt with gold trim and velveteen red pants. The fabric neck shield on the pointed hat is a flap designed to provide extra protection to the wearer's neck from the intense sun and dust storms. This deluxe Garnet wise Man costume will have you ready to perform at the next Christmas story telling or Church event. Fun World Wise Men Purple, STD. Up to 6' / 200 lbs. 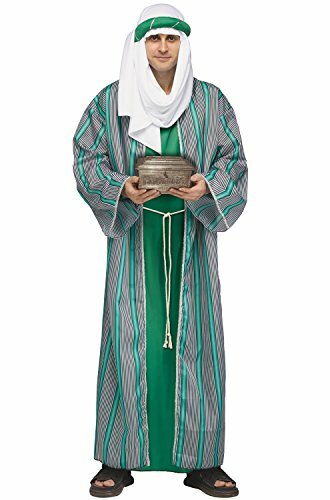 This adult three wise men costume includes a caftan, cord belt, and headdress. The three wise men costume is available in your choice of red, green or purple. 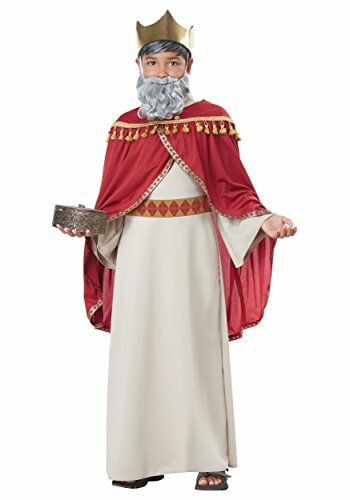 This three wise men costumes comes in adult size Standard. 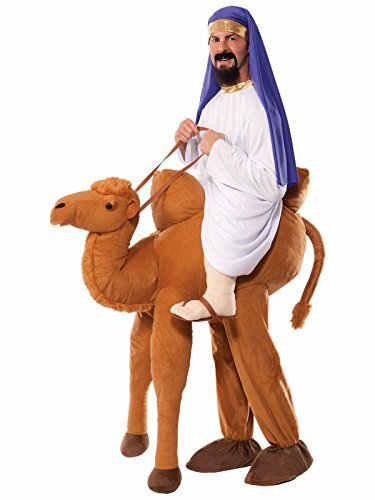 The gift is not included with this nativity three wise men costume for adults. Please note: This item's color may vary due to inherent manufacturing variations or your computer monitor's color settings. The item you receive will be identical or substantially similar to the item pictured in this listing. Part No: 131944P-N/A-STD. Up to 6' / 200 lbs. The wise man from Persia, The Melchior child costume includes a robe with attached decorative belt, cape with trim, and a fabric crown. Balthazar Wiseman Biblical costume includes tasseled hat and striped metallic robe with attached cord belt, both with gold braid trim. Rubie's Costume has the licensed and non-licensed costumes, decor, and accessories for every season: Halloween, Christmas, Mardi Gras, Easter, and all in-between. Family owned and operated in New York state since 1950, Rubie's has a serious mission to make dress-up fun and safe. You'll find traditional costumes for kids and adults, flirty looks for adults, mascot and rental quality costumes, haunted house decor, masks, wigs, accessories, shoes, and more.